Fashion in the 1960s saw a lot of diversity and featured many trends and styles influenced by the working classes, music, independent cinema and social movements. In the UK, the fashion focus shifted from Paris to London, with designer Mary Quant leading the “Swinging London” revolution. Vidal Sassoon transformed women’s hairdressing, taking the humble bob and reinventing it to suit the mood of the decade. 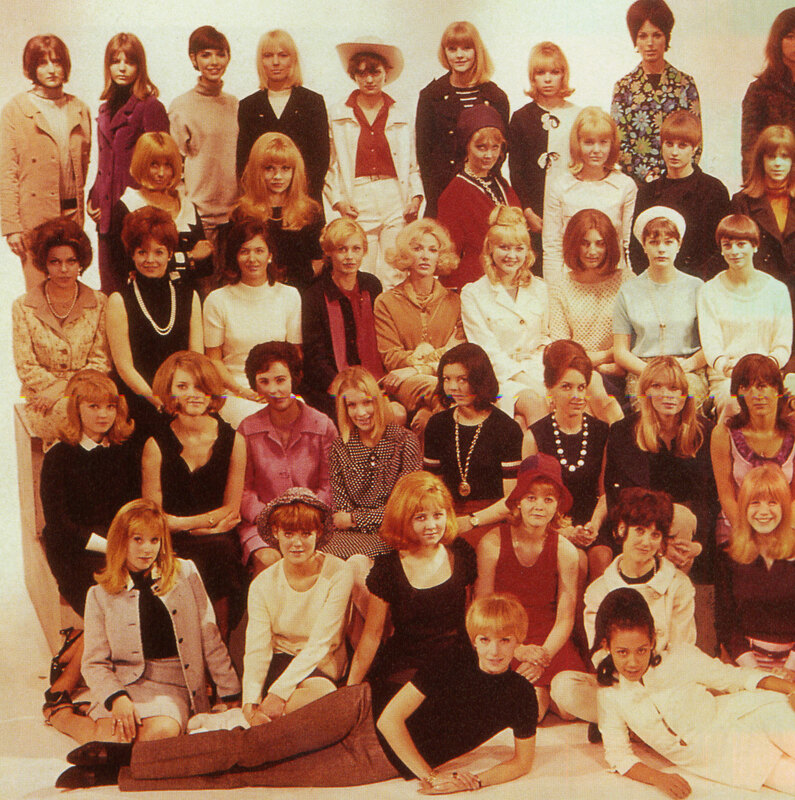 Here we look at 1960s hairstyles, the influences and popular accessories. Since the dawn of film, movie stars have been influential on fashion trends. During the 1960s, New Wave cinema and Italian films in particular influenced popular culture and catapulted Brigitte Bardot, arguably the ultimate ’60s siren, to international stardom. Other iconic actresses of the era include Julie Christie, Catherine Deneuve, Audrey Hepburn, Sophia Loren, Elizabeth Taylor and Jane Birkin – all with their own style and signature look. The impeccably groomed American First Lady Jackie Kennedy (later Onassis) influenced a whole generation with her elegant outfits, bouffant do and pillbox hats. Elements of the “Jackie O” style are still admired and imitated today. Hairdressers have always developed new hairstyles and influenced hair fashions. The new decade welcomed the voluminous beehive, created by a Chicago-based hairdresser, followed by the advent of sharp, short crops by Vidal Sassoon, the hairdressing star of the ’60s. Sassoon created iconic styles and popularised short hair with geometric and asymmetrical cuts that revolutionised women’s hairstyling. The cutting-edge Sassoon styles were fresh, sleek and sharp – and the looks were imitated around the globe. Style guru Mary Quant and actress Nancy Kwan had Sassoon cuts. Other hairdressers include Louis Alexandre Raimon, who created Elizabeth Taylor’s Cleopatra look and styled movie stars like Greta Garbo and Audrey Hepburn, and Raymond Bessone, who trained Vidal Sassoon and is believed to have influenced the modern bouffant. Music also had a big impact on fashion and hairstyles. Since the late 1950s, the styles worn by the rock and roll singers and popular bands of the era were embraced by lovers of the music, and teenagers developed their own “street fashion”. This influence continued right through the ’60s, from the über-fashionable mods, through to the psychedelic sounds of the later sixties. The Beatles famous early ’60s “moptop” hairstyle influenced men’s (and quite probably women’s) hairstyles for a generation and is synonymous with the ’60s. In the second half of the decade, political activism, social changes and psychedelic rock music led to hair for both sexes becoming longer and left more natural, in keeping with the carefree yet radical attitudes of the hippie subculture. 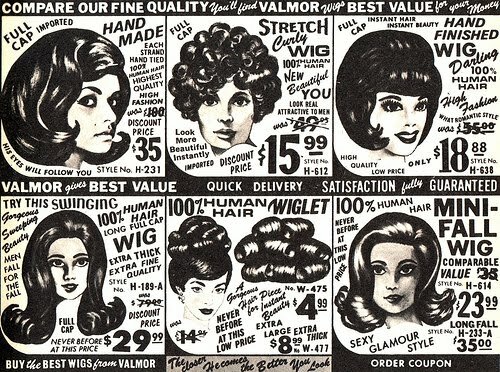 Wigs and a “wiglet” for the fashionable ’60s American gal. In the UK, Ginchy Wigs of London made various wigs and hairpieces. Fake hair was the big hair accessory of the 1960s and was worn openly. Wigs were made of real hair and generally came as a “pull on and wear” cap/weft style. Hairpieces (made from real hair) were attached to the back of the head to create width and height, making big hair even bigger. Pieces could be used to create a top knot or other dressed styles. Contrasting colours were used as well as those matching the wearer’s hair. False hair attached to a wide velvet headband was very popular, as were bows with hair attached to them. Clusters often had a comb attached to help attach it into the natural hair. Combs and slides were made of plastic and often decorated with bows, rhinestones, bright swirls or mod-inspired black and white geometric patterns. Spanish mantilla combs were used by some women in the back of their huge beehives to prevent them from collapsing. Portobello Road in London or junkshops were good places to scout for an old tortoiseshell mantilla. The fashionable young liked to tie their headscarf right on the point of the chin, as opposed to being tied under the chin like their mothers. Alternatively, scarves could be tied behind the head at the nape. A long scarf could be crossed under the chin, wrapped around the neck and tied at the back. Scarves accompanied by big dark sunglasses was the fashionable way – very Jackie O and very Cannes Film Festival! Natural items like feathers, leather bands and flowers were worn later in the sixties with the advent of “flower power” and the hippies. Hair colour came into its own in the sixties as developments in hair colour science gave rise to a plethora of new tints and tones, and improved off-the-shelf kits making it easier to dye at home. With the new colours came new techniques like “frosting” – the bleaching of small strands all over the head. Electric tongs and the new styling wand (the hairdryer/curler combo) enabled women to create big curls and lots of lift, and heated Carmen Rollers were readily available, making it easier to set/curl the hair at home instead of going to the hairdressers. Older women would not necessarily go for an ultra-fashionable modern styles and may still have worn the smaller, more mature styles of the 1950s. 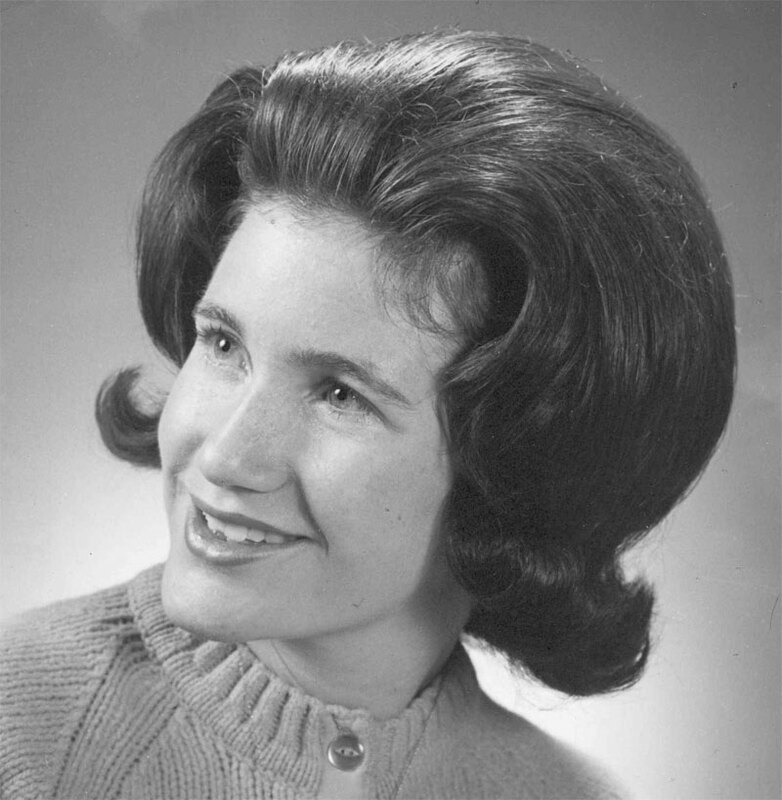 The bouffant carried on from the bouffant styles of the late 1950s. During the 1960s, it varied in size from happily rounded to pretty big. It was an easy-to-wear style, popular with women of all ages, and easy enough to create. Hair was set in large rollers to create the initial lift and end curl needed. Hair was then backcombed and finished with a smooth, rounded exterior. The ends of the hair were always curled and either flipped up (very popular), or smoothed under (like a pageboy). Either way, it was set with a mosquito-clearing cloud of hair lacquer to keep the hair and curl in place. To get even more bouff in their bouffants, women could used hairpieces on the crown, creating a towering height of hair. The beehive is one of the enduring symbol of the early 1960s – a distinctively hive-shaped, backcombed and lacquered mountain of hair that would last for many days (with a bit of tweaking and, of course, lashings more Aqua Net). The creation of the beehive is credited to Margaret Vinci Heldt of Elmhurst, Illinois, owner of the Margaret Vinci Coiffures in downtown Chicago. She had been asked by the editors of Modern Beauty Salon magazine to design a new hairstyle that would reflect the coming decade and so, in 1960, the beehive was born. The elegant updo was incredibly popular; worn by the masses and the famous alike (including Dusty Springfield and Audrey Hepburn). 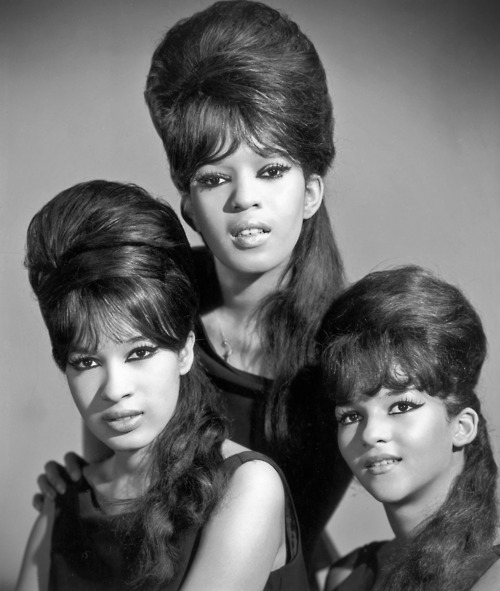 A beehive could also be twinned with longer hair in a “half up half down” style, as worn by Bridgette Bardot and The Ronettes. 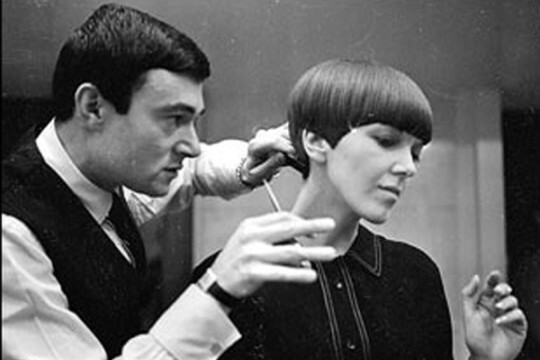 Vidal Sassoon working on his iconic angular hairstyle of the ’60s, as worn here by Mary Quant. 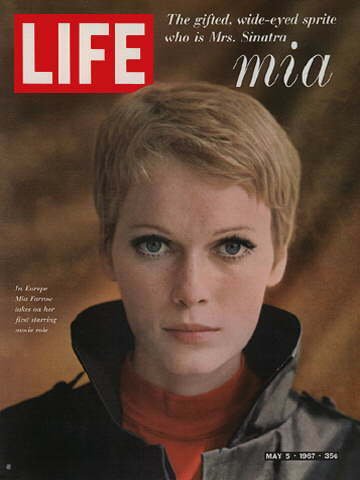 The cutting-edge short styles were pioneered by Vidal Sassoon – he started creating these styles in 1963. In contrast to the heavily-lacquered and teased bouffants, short cuts involved much less daily maintenance and fell easily into place. Wearers of the short and sleek Sassoon styles included fashion designer Mary Quant and actress Nancy Kwan. A perennial favourite, the bob is an easy-to-wear and flexible style for short hair. A bob of the 1960s varied in shape from a big round bouffant, to the sharp defined lines and angles of Vidal Sassoon’s short bob. Vidal’s bob was in vogue throughout the decade, popular with Mary Quant and the mod brigade. 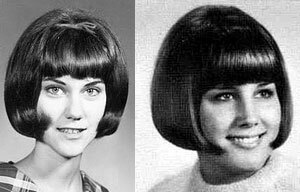 The ends of the bouffant bob could be left with a hint of sleek and smooth curl under, or the flicked forward onto the cheek. Hair was worn long throughout the 1960s, but came more into vogue in the mid/late-’60s for both sexes. During the early ’60s, hair would not simply be left down. It was worn sleek, sometimes with lift (like a bit of backcombing to achieve a smooth, rounded bouffant), and generally centre parted. Long hair could be with or without a fringe, which tended to be long. To get poker straight hair, women would iron it, often using a brown paper bag over the hair to help prevent it getting singed. Later in the decade, with the flower power influence, long hair could be left more natural and the more-than-likely-unstyled hair was usually worn centre parted, and could be with or with a fringe. Long hair could be put into a ponytail, which were worn high and often combined with a beehive or bouffant at the front. 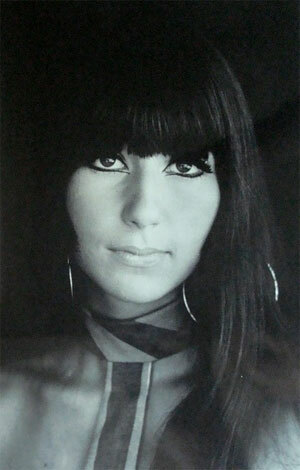 Fringes (or bangs) were popular in the 1960s. When worn, they were generally full, straight and came to at least the eyebrows in length. A side swept look was also fashionable, but not as popular as the forward fringe. 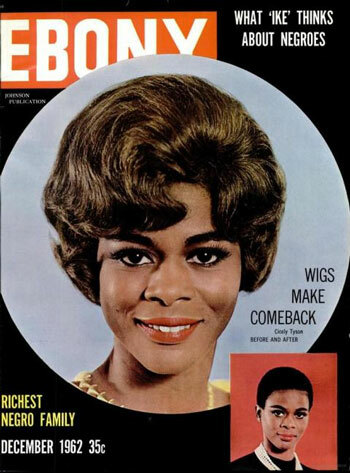 Many black women had straightened their hair during the forties and fifties, a socially acceptable way to dress one’s hair, but towards the end of the fifties, hair slowly started being left natural and cut short. Influenced by the American Civil Rights Movement, students and jazz musicians (like Nina Simone) started leaving their hair unstraightened as a symbol of racial pride. Natural hair was a strong political symbol of black pride and identity. Hair gradually became fuller and longer throughout the ’60s as the trend for longer hair continued along with the rise of political activism. Hair was teased into the classic round Afro hairstyle with a wide-toothed Afro pick. Popularity of the Afro peaked in the late ’60s into the ’70s, during which time it moved from being a political statement into being fashionable, so much so that white people got their hair permed to be tight and curly (e.g. Barbra Streisand). From the elegant, smart and groomed looks of the early ’60s and the mods to the polar opposite carefree style of the hippie, the sixties were all about revolution, experimentation, adaptation and invention. Next stop – the seventies. Vogue covers from the 1930s to the 1980s, with a few from the 1960s. I know for sure I’m also doing a 1960’s thing, but it’s an essay. I’m quite glad this existed too! As a fashion trend, highlighting became popular in the 1970s. But streaking was around in the 1960s, where a plastic cap would be used with holes in it, and strands of hair pulled though for bleaching. So it would be perfectly possible for someone to have streaked hair in the 1960s, even if the fashion hadn’t yet reached its dizzy heights of the 70s and 80s. 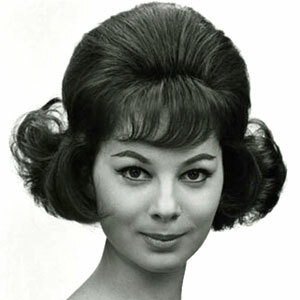 Do you know who created the ‘Bouffant’ hairstyle? This was so helpful as I had an assignment to compare sixties hairstyles today! Thank you! I know this article was written in 2012 but can I ask, do you know how to make that headscarf? The one Jean Shrimpton is wearing? thank for all the info i really needed it for my project ! thanks to you im so prepared for this essay on 1960s …. thanks to creators of website once again ! Thanks! I found the pages later, I just hadn’t looked close enough. Is/are there another article[s] on hairstyles or makeup from the 1920’s or 1940’s?